Out of the all the heartbreaking and dehumanising things that can happen to a person, losing one’s memories has to be at the top of the list. Alzheimer’s disease touches so many people in the world, with almost everyone knowing someone who has been diagnosed with the debilitating disease. Usually classified as a disease that strikes the elderly, it’s not often that a young mind is plagued by it. Nor is it often that we see a film that presents the disease for all its tragic realities from the perspective of the sufferer themselves. 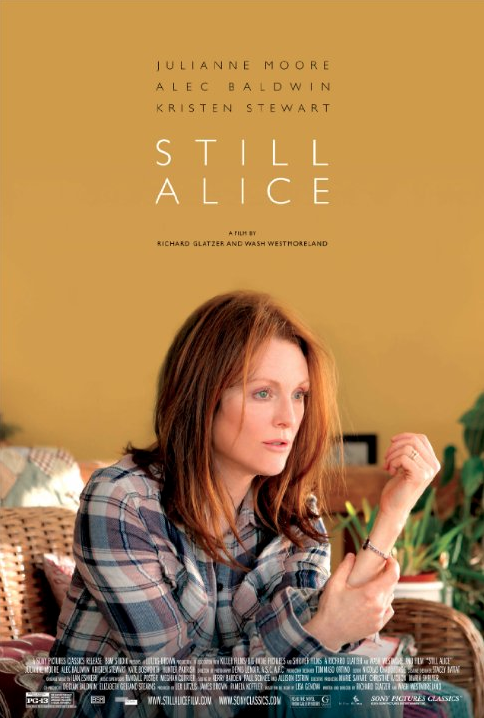 Still Alice attempts to rectify this, telling the harrowing story of a woman faced with an horrific truth: that she will slowly forget everything she knows and everyone she loves. Alice (Julianne Moore in a gut-wrenching, Oscar-winning performance) is a University linguistics professor with a loving husband (Alec Baldwin) and three adult children (Kristen Stewart, Kate Bosworth, and Hunter Parrish). She begins to forget small things, like names, words and places, and is subsequently diagnosed with early-onset Alzheimer’s disease. It’s a cruel twist of fate for someone whose livelihood revolves around words. Simple things like remembering where she left her phone become a huge concern, and we see the frustration and embarrassment Alice feels as she attempts to cope and understand what is happening to her mind. In films about Alzheimer’s, the audience rarely gets to see the story told form the sufferer’s perspective. Usually films tend to focus on the way the sufferer’s loved ones have to cope with this dreadful disease, which can either turn out superbly (Amour) or shamelessly melodramatic (The Notebook). In Still Alice we get a first hand account of what it’s like to slowly lose everything that you hold dear, as Alice’s mental state declines, and she strives to make the most of her life before it’s too late. But as her husband, children and friends try to help her cope, they each come to the realisation that eventually the Alice they know and love will cease to exist. Co-directors and writers Richard Glatzer and Wash Westmoreland adapted Still Alice from Lisa Genova’s 2007 novel of the same name. The novel is told from a first-person perspective, with Alice narrating her own story as she spirals into the terrifying unknown. The film keeps this unyielding sense of confusion and fear, as Alice is constantly humiliated and ashamed of what is happening to her mind. Glatzer and Westmoreland aren’t interested in providing flashy and entertaining direction; they’re concerned with something far more important. Their direction is subtle and restrained, a perfect way to show respect to Alzheimer’s sufferers and provide a realistic portrayal of life with a disability. As one of the greatest actresses of her generation, Julianne Moore is consistently good in everything she does. Her performance in Still Alice is subtle, heartbreaking and full of humanity; she anchors the film by a depicting Alice as an unlikely hero who is losing a grip on reality, making her both an unreliable narrator and a tragic figure. Moore is supported by a transformative and endearing performance by Kristen Stewart as Alice’s eldest daughter, Lydia, who at a very young age must come to terms with the fact that she has to place her mother’s life before her own. Tragically, co-director of Still Alice, Richard Glatzer died on the 10 March 2015 after a long battle with ALS. Although he was unable to attend the Oscars to watch Moore win her Best Actress award, Moore paid tribute to her director in her acceptance speech saying, ‘When Richard was diagnosed with ALS, Wash [Westmoreland, Glatzer’s husband] asked him what he wanted to do. Did he want to travel? Did he want to see the world? And he said that he wanted to make movies, and that’s what he did.’ Glatzer and Westmoreland made Still Alice as a tribute to everyone suffering from a debilitating disease, and to their loved ones who have to watch them suffer, and with the film’s heartbreaking final scene, they definitely achieved what they set out to do.